Monday May 29th 1893 We got an early start and did the washing by ten oclock as soon as I ate my dinner I began to iron. With Josie's help it was all finished by four oclock Fanny was over the river. I sewed some carpet rags. Robbie is ten years old today. 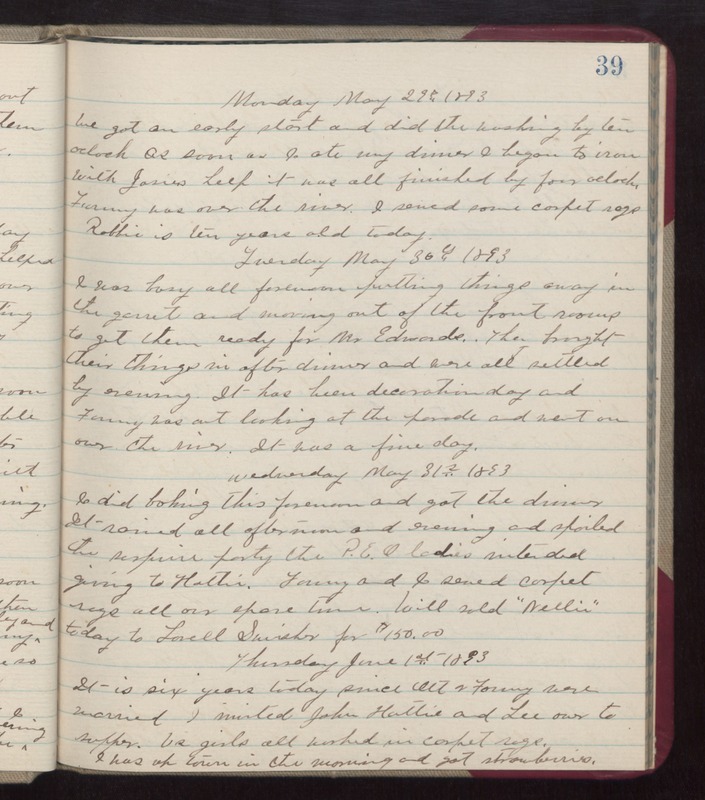 Tuesday May 30th 1893 I was busy all forenoon putting things away in the garret and moving out of the front rooms to gt them ready for Mr Edwards. Then brought their things in after dinner and were all settled by evening. It has been decoration day and Fanny was out looking at the parade and went on over the river. It was a fine day. Wednesday May 31st 1893 I did baking this forenoon and got the dinner. It rained all afternoon and evening and spoiled the surprise party the P.E.O. ladies intended giving to Hattie. Fanny and I sewed carpet rags all our spare time. Will sold "Nellie" to day to Lovell Swisher for $150.00. Thursday June 1st 1893 It is six years today since Ott & Fanny were married. I invited John Hattie and Lee over to supper. We girls all worked in carpet rags. I was up town in the morning and got strawberries.